It seems that WellPoint (WLP) couldn't have chosen a worse time to hike its rates. The insurance company, which is opposed to the health care reforms the Obama administration and congressional Democrats are promoting, handed them a public relations coup in the "here's your proof why reform is needed" category this week when it increased insurance rates on some individual policies in Indiana and California by up to 39%.To put this in perspective, The Indianapolis Starreports on one person, whose individual coverage through Anthem, a unit of WellPoint, would jump from $280 to $387.49 a month -- an increase of 38%. And if this sounds borderline illegal, that's because it can be. Unless, of course, you get permission from regulators to do it -- which WellPoint says it did, the newspaper reports. While California and Indianapolis have different insurance regulations, in light of the public health care debate, the price hikes have become a national issue this week. President Obama and Health and Human Services Secretary Kathleen Sebelius have asked Indianapolis-based WellPoint to publicly justify the increases in California. Brian A. Sassi, president and CEO of WellPoint's consumer business unit, said in his letter to Secretary Sebelius that the increase only affects the individual market -- people who buy policies on their own, rather than through their employers -- about 10% of its business in California. WellPoint also claims that due to the recession, many individuals have reduced their premiums or stopped buying coverage altogether. Meanwhile, those who are keeping their insurance are most likely the ones who need it most -- i.e. sick people. In other words, Wellpoint is claiming it's getting more expensive for it to provide the coverage; hence, the increases. Perhaps, but then how can Wellpoint explain its $2.7 billion profit in the last quarter of 2009, Sebelius asks? To be fair, this figure includes a one-time gain; adjusted earnings were $536 million for the quarter. A lower figure, but still quite respectable. Where Does All That Profit Come From? The insurance industry said the report was incomplete and compared 2009 to a recessionary 2008. 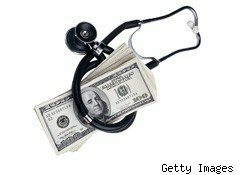 There's no denying the insurance companies reported substantial profits, but they claim it was the result of raising rates to catch up with rising medical costs. Indeed, U.S. spending on health care continued to grow. In 2008, increased 4.4%, reaching 16.2% of GDP. WellPoint itself said that its medical costs rose 8.9% in 2009. Does that justify those huge premium hikes? Of course, raising premiums is not the insurer's only questionable practice; others include getting rid of costly customers and cutting reimbursement rates for treatment. Also, the issue of what percentage of premiums actually gets spent on medical costs could certainly bear closer scrutiny. And WellPoint is not alone in hiking premiums and other practices. This week's news supports the Democrats' argument in favor of the health care bill, which would prevent such price hikes and better regulate insurers. While Republicans may feel uncomfortable standing with WellPoint on this one, they still claim that aspects of the health care bill are unconstitutional, including the part that requires people to carry insurance. Interestingly, while WellPoint disagrees with the health care reform legislation in nearly every other particular, it's that last point about forcing everyone to buy coverage that the company actually likes. Regardless, by targeting a group that was already among the most vulnerable and overcharged under the current system -- people without employer-sponsored health care -- it seems WellPoint has handed those who favor health care reform yet another smoking gun.